This week brought some excitement our way -thankfully, rather than floods, it came in the form of baby animals, surprise proposals and a hidden jackpot. The kids loved the experience and I thought it was pretty cool too. It was a relief to know that "Fuzzy" would be well cared for and eventually released. My youngest son, quite the opportunist, managed to scrounge up $24 in change from around the house and felt like he hit the jackpot at the CoinStar machine. :) Little Miss captured a caterpillar, also named "Fuzzy." And I had the opportunity to photograph a surprise marriage proposal at the beach, right next to King Neptune. All in all, not a bad week. 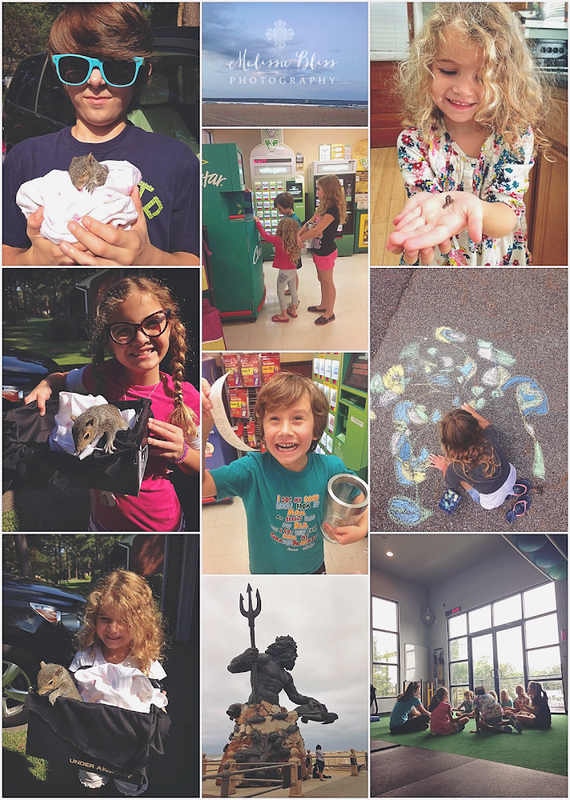 Aw, my kids would love the baby squirrel, too --so cute! Poor little squirrel! Love that chalk picture, so extensive! WOW- what an exciting week for them!!!! Too fun! What a wonderful post of weeks happening and great photos to match ~ Happy Weekend to you and your beautiful family ! Very late, but not too late:) Love the street art! Always good to develop compassion in kids! Such a special adventure for your sweet children, having rescued "Fuzzy"! Beautifully captured moments!